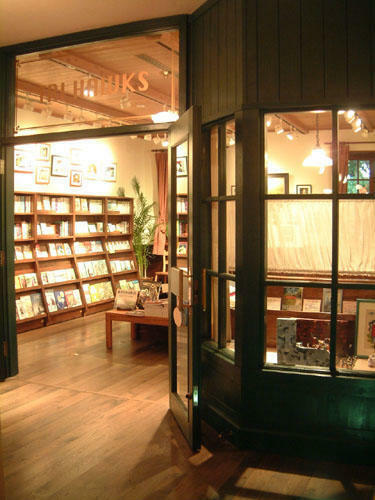 "TRI HAWKS (a pun on the name of the city "Mi-taka"--literally 3-hawks--where the museum is located)" is the reading room inside the Ghibli Museum. It was created to communicate the Museum's wish to have children see, touch, and feel strange and mysterious things through books. Books which are specially recommended by Hayao Miyazaki and the Museum can be found here for children to browse through freely. Available for sale at the Ghibli Museum, the "The Art Collection of the Ghibli Museum" includes cell art, art print cells, hand painted cells, and woodblock prints of scenes from Studio Ghibli films. The production of the framed cell art is supervised by the museum's Executive Director Hayao Miyazaki and the color design is under the direction of Michiyo Yasuda. The woodblock prints are made by Keisuke Miyazaki.